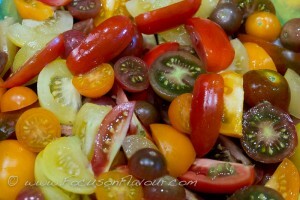 A selection of smaller tomatoes – Rosada (small red plum), White Cherry (actually a lot bigger than a cherry, what I would call a small tomato), Sungold (orange colour, cherry sized), Rosella (dark red with green blush, cherry sized), Sungella / Golden Sunrise (same colour as sungold but larger), Black Cherry (darkish red with green gel around the seeds, small tomato), Brown Berry, a mahogany colour, you might just be able to see Black Russian Plum (dark red with greenish shoulders). Two of my visual favourites – Green Zebra and Amish Gold. I love having dinner parties in the garden, but the trick for me is to have as much as possible prepared ahead. The only thing that needed cooking on the night was the kofta kebabs on the barbecue, everything else was prepared and just the final presentation done at the table – people enjoy watching things coming together in front of them, before they get to demolish them! That way I get to spend lots of time with my guests, not in the kitchen (though there was a good amount of time in there earlier! ). I wanted to provide a light, inspiring meal, that wouldn’t result in anyone groaning when finally leaving the table. Quercy Melon with soft Goat’s Cheese, Cucumber and Sun-dried Tomatoes, with an olive oil and walnut vinegar dressing, and chopped basil. This recipe is in Focus on Flavour. I usually use a buche de chevre that I buy from the local market, but this time I used a soft cheese “Petit Billy”, that worked really well. 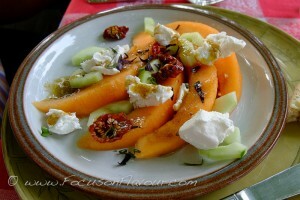 Feta could be an alternative, as it has a salty tang to contrast well with the sweet melon. 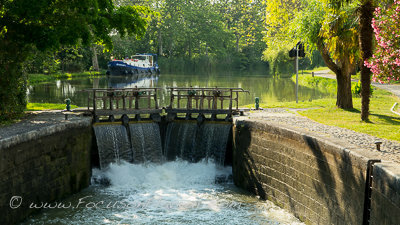 If you are in France for a visit, do buy walnut vinegar – it makes a fantastic dressing with olive oil and a little balsamic vinegar. 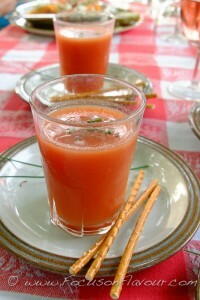 Chilled Skinny Gazpacho Shots, with cumin seed, celery salt and chives, served with pretzel sticks. 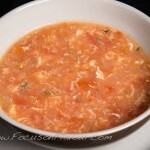 The recipe for Gazpacho is in 5:2 Healthy Eating for Life and you can find the recipe here. 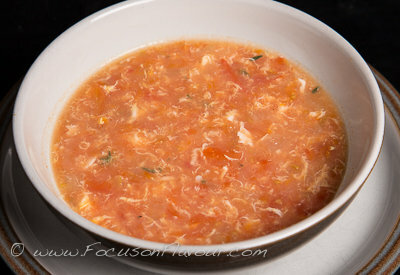 This time, I used only the flesh of the tomatoes and cucumbers (our chickens enjoyed the seeds), which resulted in a finer, more liquid drink as opposed to a soup. 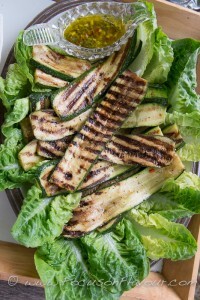 Chargrilled Courgettes with olive oil, lemon, red chilli, garlic, mint and basil drizzle on a bed of little gem lettuce. The recipe is in 5:2 Healthy Eating for Life and you can find it here. 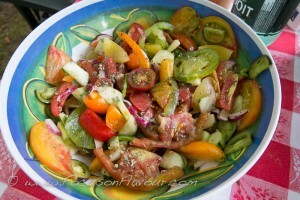 Homegrown Heritage Tomato Salad with cucumber, green pepper and red onion, dressed with olive oil, cider vinegar and dried Greek oregano. 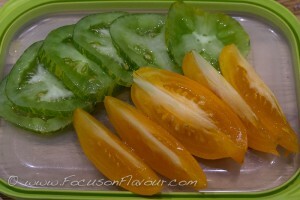 I love to grow a selection of different-coloured tomatoes and slice them in different ways to emphasis their different sizes and shapes. 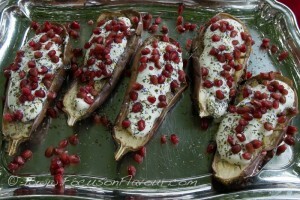 Aubergines with Yogurt topped with pomegranate seeds and spicy herb mix. Cold aubergine has been a revelation! This is based on Ottolenghi’s recipe, from Plenty, but using greek Yogurt as I cannot get buttermilk here and cooking the aubergines on the barbecue, rather than in the oven, which is so easy. Because you serve them cold, make some extra for another day, but only add the topping at the last minute. Instead of Za’atar I used a really nice spice/herb mix “Salade Bonheur” that I found in Bio-Coop, that has rosemary, lovage, thyme, tarragon, dill, oregano, basil, cumin, aniseed, marjoram, wild garlic, cornflower and marigold. It looks pretty. 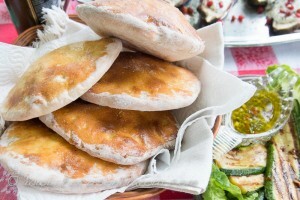 Moroccan Flatbread with Fennel seed, from a recipe in Moro, the Cookbook, by Sam and Sam Clark. I had no idea what this was supposed to look or taste like. I used my breadmaker to make the dough and divided into 5 instead of 4, so that we could have one each (but we didn’t eat that much). Glazed with egg and milk. I think another time I would cook for a shorter time or slightly cooler, so that the bread would be softer. But I liked the light flavouring from the fennel seed. 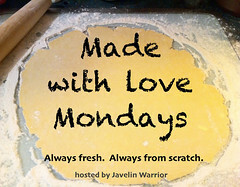 I used an organic strong white flour – Mon Bio, ‘pain tradition’. 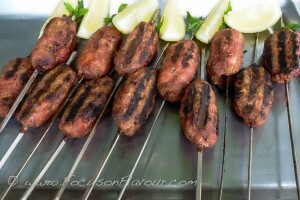 Barbecued Kofta Kebabs, made from pork and beef mince, with some breadcrumbs and egg to bind the mix, spiced with onion, garlic, ras-al-hanout, cumin, cinnamon, and cayenne pepper. 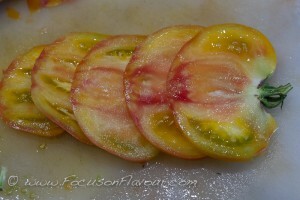 Sprinkled with smoked paprika when cooked. I used my recipe for Swedish Meatballs from 5:2 Healthy Eating for Life and adapted the flavourings. You can find the recipe here. I actually made each one a little smaller this time, only 60g each, which is 120kcal. 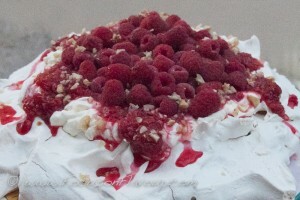 I wanted a show-stopper dessert to celebrate the fantastic crop of raspberries that we have had this year. A rare indulgence using sugar… but delightful – a cloud of crispy outer shell with a soft marshmallow like interior. 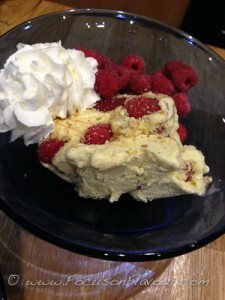 Raspberry Pavolva with whipped crème fraîche, fresh raspberry jam, raspberries and toasted, chopped hazelnuts. I was nervous about making my first pavlova and took advice from my chums over at 5:2 Intermittent Fasting Recipes from Around the World, and it worked perfectly (thank you Kim!). I added in some chopped hazelnuts, as I had originally been inspired by this recipe on delicious, which popped up on my newsfeed – but in the end decided against complicating the flavours with nectarines and honey. The raspberries are divine and deserve to shine alone. The raspberry jam is another Ottolenghi recipe, from Ottolenghi, the Cookbook. It gave just the right amount of drizzle and an extra hit of raspberri-ness. The hazelnuts were a Zen exercise, as I couldn’t buy any blanched hazelnuts. But I have a basket of nuts from M. Tye down the road, who grows them commercially. So shelling and removing the skins was a little time consuming – but overall, I think worthwhile for the added dimension of texture and flavour. I was tempted to grate some Willies Venezuelan Black 100% Cacao over the top, but maybe that would have been a step too far… maybe next time, when I may make a chocolate meringue too. No, I didn’t count the calories! The delights of a non-fast day 🙂 But apart from the dessert and the bread, these are all ideas that could make part of a delicious fast day meal. In fact, just totting up the pavlova, it actually works out to only 225 calories a serving; so whilst it seems indulgent, it is a lot less than many other desserts would be. Enjoy your summer! 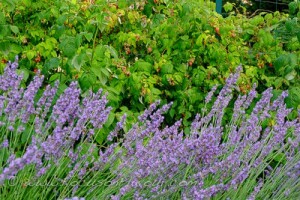 Relish in the wonderful fresh fruits and vegetables and be brave with your use of herbs and spices. 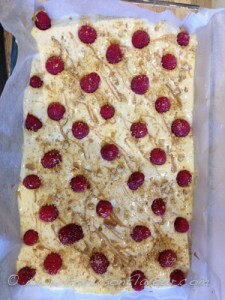 I was looking for ideas to use our bumper crop of home-grown raspberries and came across this recipe on delicious.com. An ice-cream based dessert that is a cross between a cheesecake and tray bake, but no cooking required. I have used far less biscuit and toffee sauce than suggested. Really yummy with our own home-grown raspberries! A lovely weekend treat that isn’t too high in calories. Remove ice cream from freezer and allow to soften. Melt the butter and mix in most of the crushed biscuits (reserve about a tablespoonful). Line a dish (suitable to freeze) with baking paper and press the mixture evenly across the bottom, then chill for about 15 minutes. Spread the ice cream over the base and press in some of the raspberries. 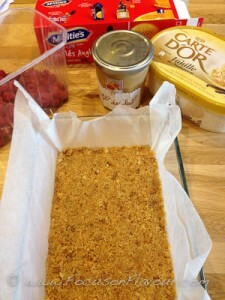 Drizzle the caramel sauce over the top and then decorate with raspberries and sprinkle over the reserved biscuit crumbs. The calorie count from this recipe card is incorrect, but I'm not sure why. I have triple checked on caloriecount.com, MyFitnessPal and with individual ingredients and all of those come to about 250 kcal per portion.